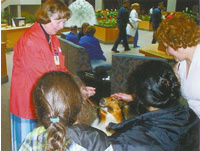 Laddie was a wonderful dog during his therapy visits and always brought joy to everyone he came in contact with. A sad and depressed face was always smiling as we left. And I will always remember the joy Laddie exhibited as he was surrounded by eight 2nd grade boys at his last school visit. One of my favorite memories of Ladies's career was a visit to Franklin, a 95 year-old friend of ours who was our minister in his earlier years. We often visited with Laddie at his nursing home and I think this is a perfect example of what a Therapy dog can do. We received a call that Franklin had been moved to Middlesex Hospital Hospice, unable to speak, recognize, or acknowledge people. We walked into our friend's room with a nurse who told him who we were and that Laddie was with us. The nurse was floored when Franklin gave a sound that let us know he knew who was there. He was blind so we moved his hand to touch Laddie's fur and positioned a 'cookie' so he could feed Laddie, something he loved to do in his better days. As we left I heard Franklin uttering some sounds. I eventually realized that he was giving us a blessing as he always had done in the past. The next afternoon Franklin quietly passed away. I guess it's true that animals can make contacts and do things humans are not able to do. More recently, Laddie and I were visiting our Senior Day Care Center and I was explaining to the Seniors about Laddie's Lymphoma. I emphasized how much Laddie enjoyed coming to see them because it made him feel better to keep doing things he liked to do. Immediately a sweet woman piped up "Now we're giving therapy to Laddie!" Everyone agreed and suddenly the Seniors felt needed and were helping someone else who needed to be cared for. A wonderful new twist to our purpose! We will miss our beloved, beautiful Laddie very much but know that he gave much of himself to others. It's something in which we can find comfort.